This practice organ was proposed concurrent with our opus 2 and represents our answer to the daily needs of organ students at Mercer University. It is a small, solid two manual instrument with 3 independent 8 foot stops (the six wooden façade pipes being a common bass). 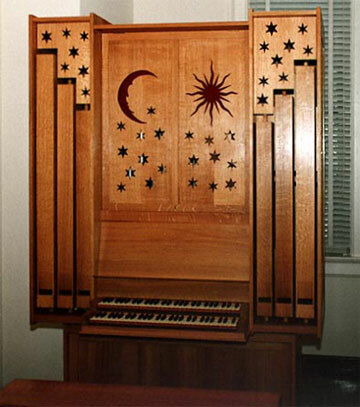 Such an instrument becomes the ‘workhorse’ of those wishing to perfect their organ playing technique and repertoire without tiring the ears with ever larger sound. The case is of white oak, with pipe shades designed by Russian artist Daud Akhriev.